Figure 1. Fungi growth on wood can be seen in stored logs, stored wood chip piles, processed wood materials during storage, or in blended substrates that contain wood products. Decomposition (decay) is the breakdown of dead plants, animals, or other organic matter. Thanks to these processes of biological decay, the Earth is not knee-deep in dead vegetation, excreta, and animal corpses. Anyone who works with or relies on organic materials to perform functional tasks understands that they (we) are inevitability fighting a losing battle. All organic materials (carbonaceous) are destined to return to the atmosphere and once again enter the cycle of life that has kept, and continues to keep, our planet functioning. As a substrate scientist, I certainly understand that we cannot stop the biological process (breakdown, nutrient tie-up, etc.) of organic substrate materials, but we can try to slow these processes down long enough to maximize their use as growing media constituents for the production of horticultural crops. Let’s take a quick look at a few biological occurrences influencing substrates and container crop production. Microbial/fungal decomposition of organic materials, and the rate thereof, is dependent on many variables including moisture, oxygen, and readily available food sources. The presence, timing, and severity of these biologicals (fungi, bacteria, molds, algaes, etc.) on organic matter depends on many variables. Specifically relating to wood, some of the most observed fungi, including white rot, brown rot, and bluestain, can be seen on tree logs or freshly chipped logs within days of harvest. They are most notably recognized by the blue/gray stains along the wood surface as seen in the top of Figure 1. This fungal discoloration does not negatively affect the wood from being successfully used as substrate. This stain does not occur if trees are harvested, chipped, processed, and then dried quickly (within days). Figure 2. Fungal and algal growth has been observed during crop production when using fresh wood components in substrates. Once dried, wood materials will retain their blonde coloration, usually through crop production. Other Saprophytic fungi can be seen on wood chips during storage (before processing) if they are moist and not allowed to dry as seen in the middle of Figure 1. This type of fungal growth on wood feedstocks is not advised and should be avoided by wood substrate manufacturers. 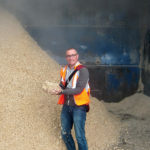 This can be avoided by drying the wood chips (or allowing them to dry) before storage if they are not to be processed immediately. Fungi have also been observed in wood components (before or after blending with other materials) during storage. During crop production, fungi have also been seen on numerous occasions over the years but mostly in mixes with high percentages of wood being used (Figure 2). Algae is no stranger to wood substrates even when used in lower percentages (20% to 30%), as seen in Figure 3. Algae growth on wood (and other organic substrates, too) is often enhanced or eliminated by irrigation practices (keeping the surface drier). Most algae observed has been in overhead or drip-irrigated crops. Figure 3. 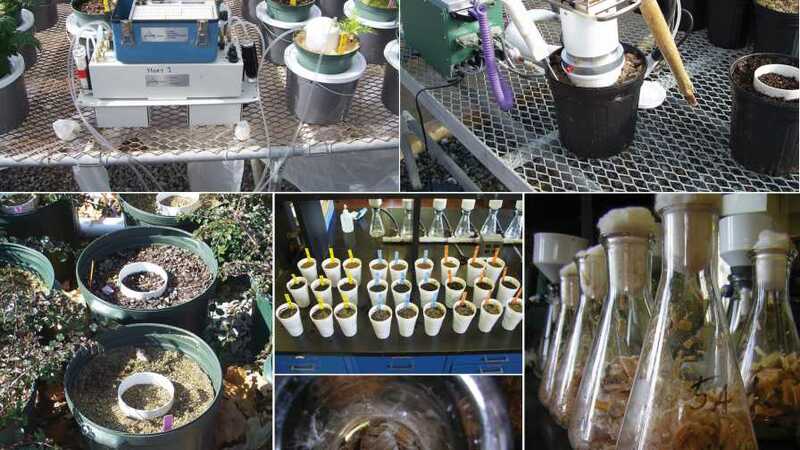 Measuring and monitoring microbial and fungal activity in substrates has provided some understanding of the impact these entities have on crop production and nutrient/fertility management in substrates containing wood components. Measuring the extent and influences of microbial and fungal activity in substrates is important to further our understanding of the best management practices needed for utilizing any organic-based materials. Parameters to assess microbial activity include carbon dioxide (CO2) efflux/release, oxygen consumption, chloroform fumigation, shrinkage of substrates over time, particle size reduction, changes in physical properties (bulk densities, water, and air capacities), nitrogen immobilization, etc. (Figure 3). Past research has shown the increase in CO2 efflux (generated by the respiration of the microbes) emitted from containers that have wood components as part of the mix. The wood is more microbially active than peat, bark, or other aged/composted components in substrates thanks to its high carbon:nitrogen (C:N) ratio and the presence of soluble/consumable organic compounds that microbes can quickly and easily feed on. The major wood substrate components currently produced and commercially sold are not aged/composted. The reasons for not composting wood substrate materials are many. Maybe the most asked about topic relative to the trialing, adoption, or use of wood substrates is the fear of nutrient tie-up (immobilization) leading to hungry plants. Microbial immobilization of nutrients, primarily nitrogen, has been and continues to be one of the largest obstacles to understand, but also one of the easiest to overcome. Wood substrates (fibers, chips, etc.) do attract microbes and those microbes do tie up nitrogen. 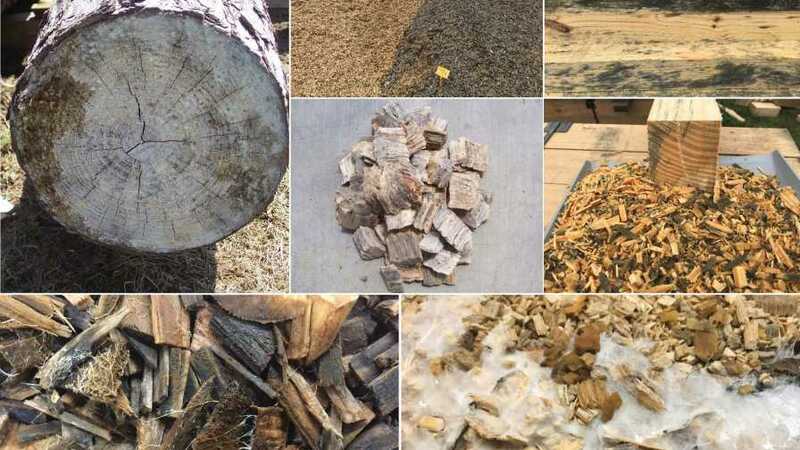 The severity of which depends on several factors including 1) percent of wood addition to the mix; 2) particle size of wood components; 3) processing technique used to make the wood; 4) species of wood, and; 5) age and handling of the wood substrate. The nitrogen tie-up that growers may see or experience will depend on what their standard/traditional fertility program is (light, moderate, or heavier feeders), as well as what crops they are growing and their irrigation delivery systems (from top or bottom). Growers can adjust their controlled-release fertilizer/slow release fertilizer or their fertigation schemes accordingly based on the percent of wood used. Close monitoring of container EC (via the PourThru method, for example) will help identify fertility issues and nutrient drawdown, so it can be corrected before plants are affected. Aside from nitrogen, researchers have also observed a deficiency of sulfur in crops grown in 100% pine wood (or close to 100%). Sulfur is rarely a problem in crop production as it is in many fertilizer formulations, but it is also inherently present in organic substrate materials (in organic and inorganic forms). Wood, however, has little to no sulfur when used in high percentages. Research has shown that most any sulfur source will work, but the easiest fix seems to be 1.5lbs/yd3 of fine-grade gypsum (calcium sulfate). Figure 4. 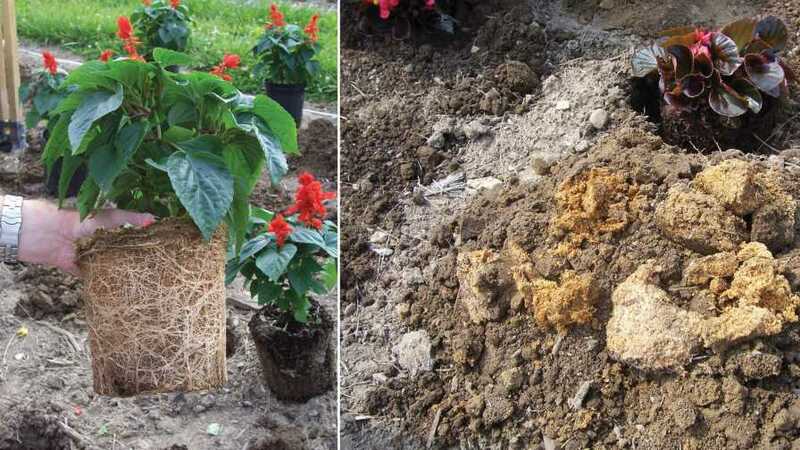 Biological activity and degradation of wood-based plant rootballs after being planted in the landscape has so far shown not to be an issue. 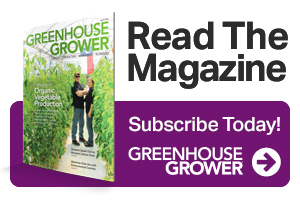 Some questions and concerns have been expressed over the years regarding the behavior and success of plants grown in wood substrates once they are grown, sold, and planted in the landscape. Will termites eat the rootballs of these plants and leave large holes in the ground? Will plants become nitrogen deficient due to further/accelerated microbial nutrient tie-up? So far, the answer to those questions is no. After 15 years of monitoring post-transplant landscape success of numerous herbaceous and woody crops (including trees grown in 25 gallon containers with 100% pine tree substrate), there have been no concerns reported or measured. 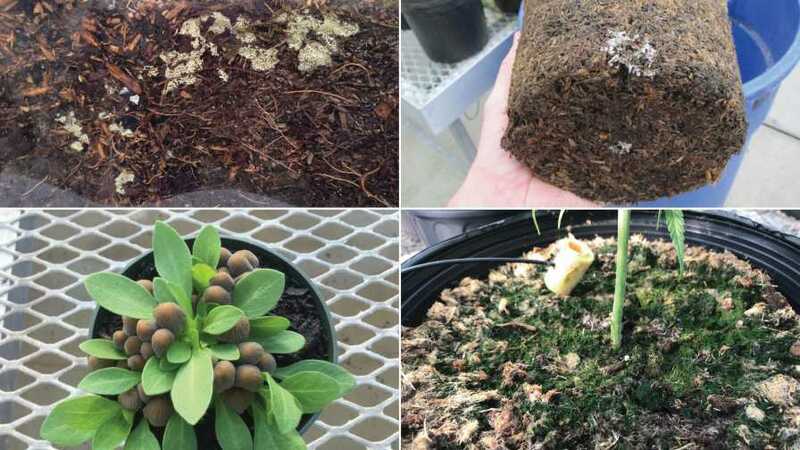 Past experiments in post-transplant evaluations of plants grown in 100% pine tree substrate have shown that not only do the rootballs not readily decompose, they oftentimes will not change color, even after one year in the ground (Figure 4). The yellow pine wood evident in the photo was from one-gallon plant rootballs planted the previous year. Pine wood is especially decay resistant even in mineral soils, hence its rise to the top of desired wood species for substrate use. Post-production shelf life success of plants grown in substrates containing wood. Whether these (and other) unknowns are good, bad, or indifferent to growers and their crops is something that we must work to understand.